Just having the opportunity to see one leopard is thrilling enough, but to have three different leopard sightings in one day, that is magical and unbelievable. Imagine sitting down at the Lunch Banda, a beautiful scene already as you sit looking down the Msine River onto the plateau in front of you, enjoying some Chapatti, Lamb stew and Pilau; the flavours and smells controlling your taste buds, the setting breath taking; and to top it all off, Ian and Heribert springing almost simultaneously, and shouting, “Leopard!” This setting a ripple effect in tone as all the guests and I, jump with binoculars in hand swinging around to see a female leopard making her way to the Msine River, inspecting some Impala as they drink from one of the few pools of water fed by a spring. The spotted cat, moving back and forth, was scanning the surroundings for the best approach. Unfortunately one wrong step and a flock of Helmeted Guinea fowl simply give your position away, with their consistent cackling. A different female but sitting ever so nonchalant in front of the herd of Buffalo, looking down the gully cut away by the young Msine River. She grooms her pelage without a care in the world. Camera buttons going as we watch her every movement. Suddenly something catches her attention, something we cannot see from our position and from grooming, lounging about to instant, stalking motion. Glare and gaze fixed, a slow approach, then into a crouch. Nothing, whatever she spotted, has left as her body language begins to relax again. 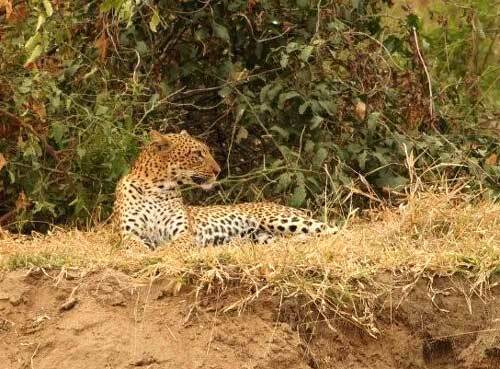 She then casually gets up and walks to a termite mound, lying down upon it without a care in the world. Watching, enjoying the vista’s that lay in front of her. Not too long, she moves down into cover as an Elephant bull makes his approach down the embankment of the Msine River into the riverbed below. This Elephant bull was in search for water, to quench his thirst. Kicking with his front foot, digging until the underground flow begins to filter through, creating a small water hole to drink from. 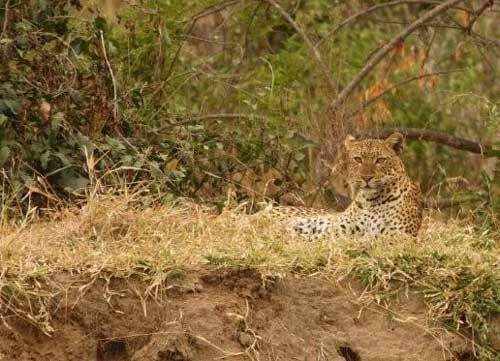 The female leopard still crouched out of sight, and from behind her an impala ewe starts advancing close to the termite mound. Karin and my thoughts, she is going to make a kill. Not a breathe as we both watch in anticipation, both knowing what can happen, the impala is literally at pouncing stretch – and the leopard just watches it go past, down a hippo path to the rivers bed. Only once the Impala ewe has walked right past her, does she go for her, but not before a troop of Vervet Monkey’s sound out an alarm. The Impala bounds, leopard pounces, all in front of us and down, across the Msine dry riverbed, and past an Elephant bull drinking. Now not only a jumping Impala followed by a leaping leopard, but now also a charging elephant, all in an afternoons drive. What an exhilarating day? 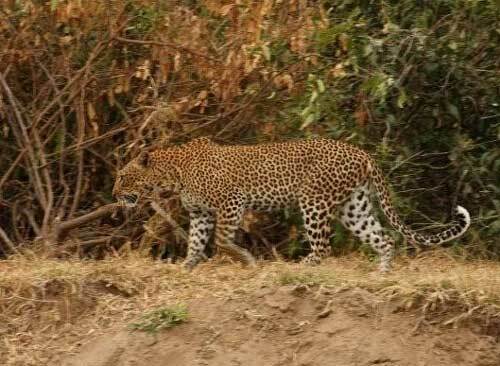 But the leopard sightings weren’t over, for as a guest was allowing the outdoor showers water droplets to massage at her muscles, the female leopard from lunch, made her way between the Banda’s. Honeymoon couple now peering over the shower wall, watching as the leopard made her way past their room into the valley below. A fitting end to a leopard filled day. 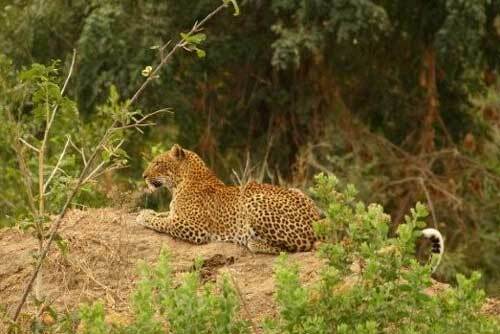 We’ll be there in about 6 weeks….keep those leopards happy in the meantime! We want to see them when we arrive! Fingers crossed! We shall try and keep them happy.